Ford is refreshing the look of the Ford Fusion sedan into a more aggressive, “sporty” look – which is fitting considering the company is bringing back the Fusion Sport, which is 325 hp closer to the Fusion ST we all want. 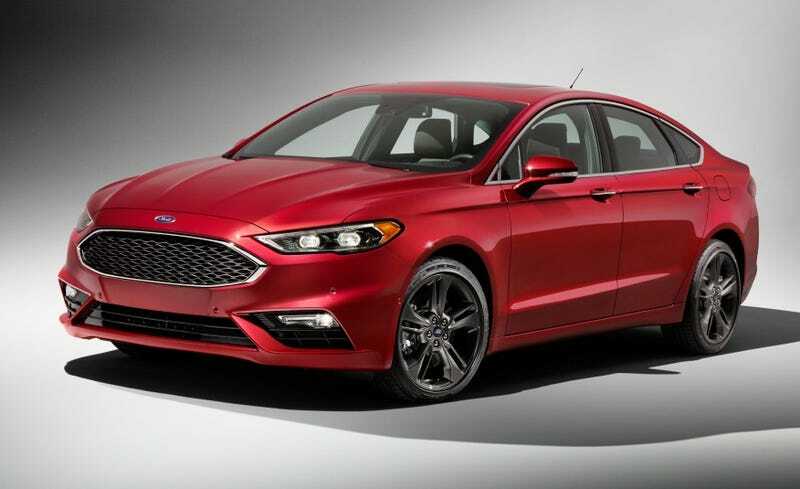 Apart from the cosmetic upgrade, the Fusion gets the new twin-turbo V6 powerplant, though all non-hybrid trim levels are still subject to the 8-speed auto. The 1.5 and 2.0 liter Ecoboost engines also get new dual-scroll turbochargers, with outputs of around 200 hp and 250 hp, respectively. The new Fusion Sport gets some extra pampering, receiving custom dampening technology shared with the Lincoln MKZ, an anti-roll bar system, spring-rate calibrations, and wheel-mounted paddle shifters (which aren’t horrible; I have them in my Focus). The interior of all Fusions will now come with a knob instead of a lever gear selector, and the updated SYNC 3 infotainment system with Apple CarPlay and AndroidAuto capability. The facelifted vanilla Fusions will go on sale in May of this year, with the Sport model showing up just a few months later in the summer.